I made these pumpkin muffins a few days early JUST in case you were looking for that last minute pumpkin recipe before Halloween. I'm sure some of you are pumpkin and apple'd out, but October is not over yet friends. 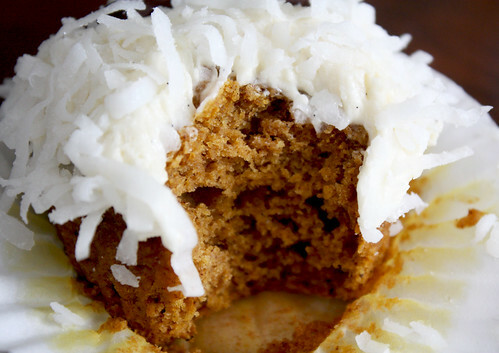 These pumpkin muffins are good for you, very filling, and full of spice. 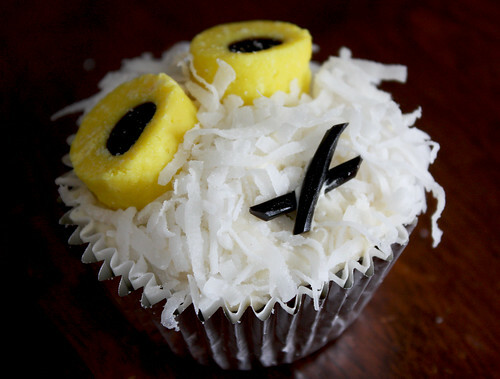 They are good for any occasion, and the cream cheese icing and shredded coconut add a very nice touch. I brought some for my sister and her boyfriend, and they each ate two on the spot. I was in a festive mood, so I decorated a few with a Halloween theme. This recipe yields 16-18 muffins. Make the Pumpkin Muffins:1. Preheat the oven to 350F/175C. 2. In one bowl, mix the flour, brown sugar, baking powder, baking soda, and dry spices together. In another bowl, mix the pumpkin, milk, egg, vegetable oil, vanilla extract, and ginger together. Add the wet ingredients to the dry ingredients, and mix well with a fork. 3. Line a muffin tray with baking cups. Spoon the muffin mixture into the baking cups until they are 3/4 full. Repeat until all the muffin mixture is used up. 4. Bake the muffins for 18-22 minutes. Remove from oven and set aside until they are fully cool. 1. With an electric mixer on high speed, mix the butter and cream cheese until smooth. 2. Slowly add in the icing sugar while mixing. 3. Add the vanilla extract. 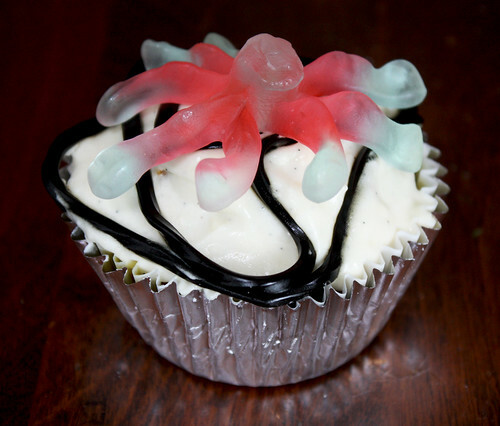 Cut a vanilla pod in half, and scrape the vanilla seeds into the icing. Mix until evenly distributed. 1. Using a butter knife, smear a thin layer of icing over top of the muffins. 2. 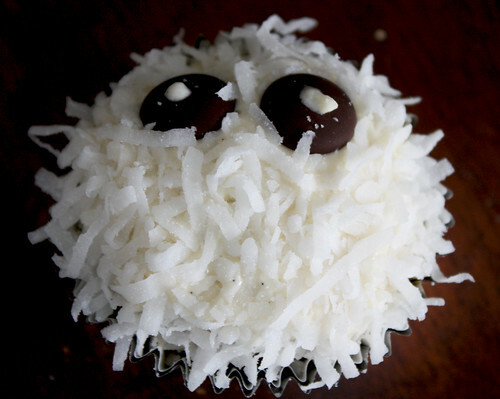 Place the muffin on top of a plate, and sprinkle shredded coconut over top of the muffin until completely covered. Tip the muffin upside down to allow any loose coconut pieces to fall off. Using low fat cream cheese for the icing will result in a slightly thinner consistency. If you want a think and creamy icing, it is best to use full fat cream cheese. For the next little while, you will have to excuse my posts. I have such a large backlog of travel posts, I'm not sure where to start and finish! I just got back from a short trip to Boston, so stay tuned for a mish mash of posts from Ottawa, Sydney, New Zealand, and Boston. 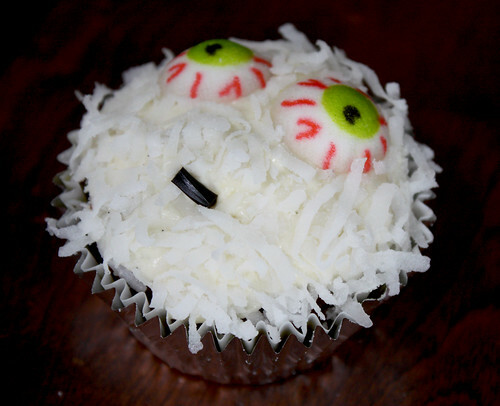 They just sound like hers..The eyes have it :)And of course the cream cheese icing crowns them..with the coconut tiara tips. Oh my...thanks for the catch. I did add one egg to the muffins. I guess you can leave it out for a vegan recipe. Thanks. btw, how did you do the decorations? were they mostly candy? I can never find anything looking like EYES! Yea, the eyes were mostly candy. I went to my local bulk store and bought everything that looked like eyes. The pictures are the ones that turned out best. 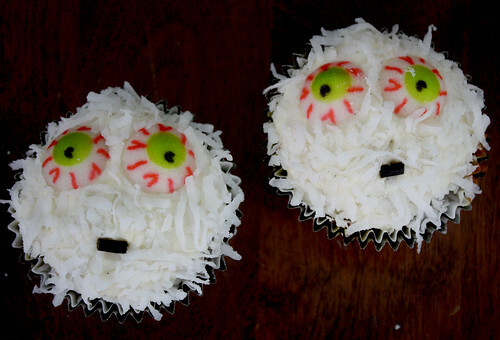 The first picture used pre-made candy eyes. The third picture used English Allsorts licorice candy, and in the last picture, I used chocolate wafers, and dotted them with my leftover icing. awesome idea! Great pictures as well. Thanks for your comment, and thank you for bookmarking my site. Hope the muffins turn out well.